Wedding videos are my favorite activity as a professional videographer - I love the "Heart" connection with all my wedding couples. Many couples remain part of my "Extended" family to this day, sending me pictures of their new family arrivals (baby pic's! ), thank you notes and referrals to other friends and family members. My approach to wedding videos has changed dramatically over the past few years. I no longer pursue the $2,500 to $3,500 wedding gigs with 2-3 videographers and drones flying overhead. There are so many couples that want a beautiful video of their special day but do not have, or want to spend, thousands of dollars and yet are leery of some of the "lower end" videographers out there. It is my goal to provide a wedding video to those couples using the same $25,000 + of gear (well, not all of it, but a lot), that I use in my commercial video work, and the same expertise in both filming and editing to create an affordable, beautiful wedding video. I use at least two, and sometimes three, camera's during the ceremony to capture all the special angles and moments and professional wireless microphones are used on both the Officiant and the Groom to provide excellent audio. 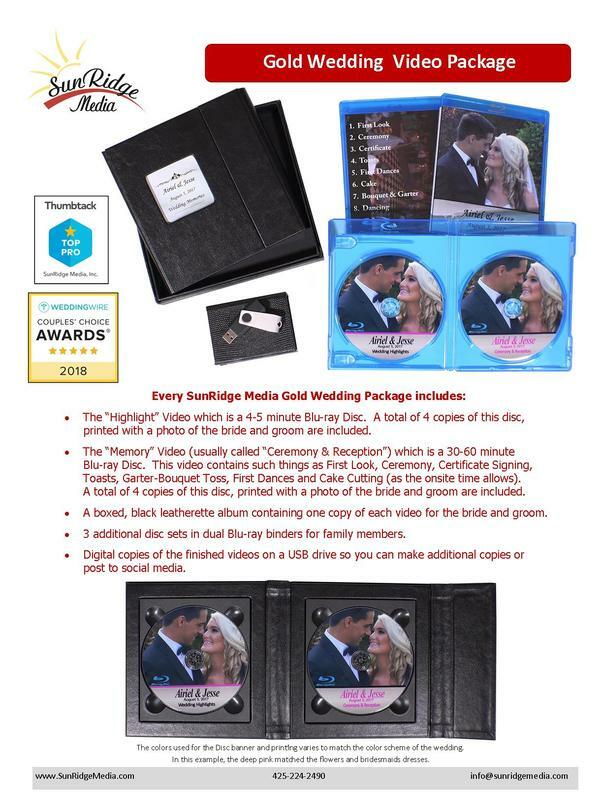 Every couple, regardless of the package they choose (except those just wanting raw video), receive a boxed video album with two Blu Ray disc's inside, one disc contains the 4-6 minute "Highlights" video and the other contains the "Memories" video with Ceremony, Toasts, Garter/Bouquet Toss, Cake Cutting, First Dances and First Look segments or chapters. In addition, the couple also receives three Blu Ray, double-disc cases with each of the videos described above to give to parents and family members. The cases have a 4-color inset picture of the couple and segments listed on the back. All finished videos are provided on a usb drive so you can make additional copies or upload videos to social media sites. 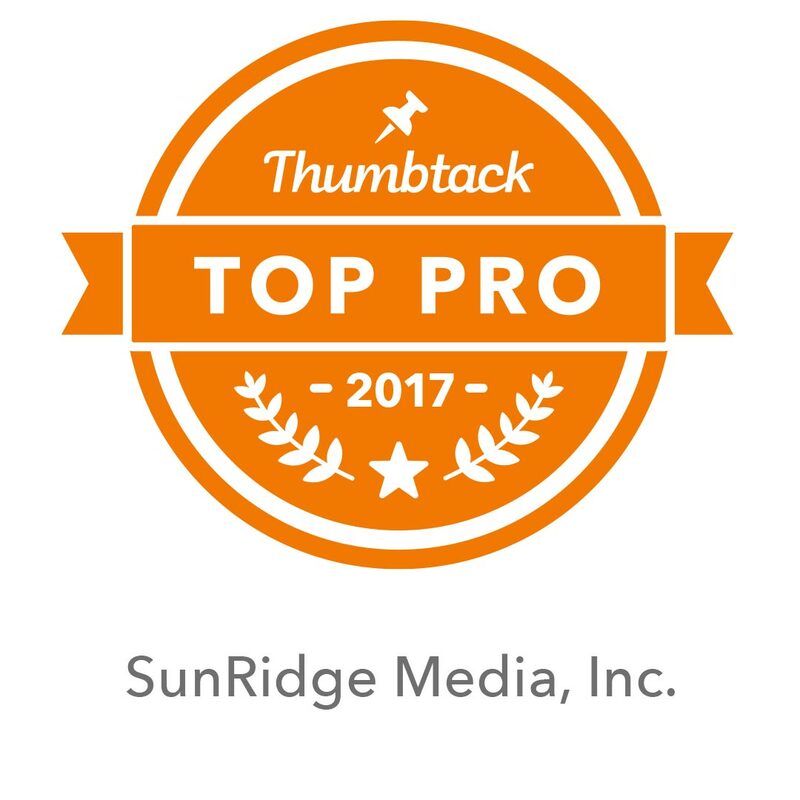 I have filmed over 100 weddings in the past few years and have earned the "Best of Thumbtack" awards for every year. In addition I was voted the "Best Videographer" for all of Seattle in 2015 by Thumbtack (commercial video). Blessings as you move closer to your big day! The purpose of a "Highlights" video is to provide the couple with a four to six minute journey through their wedding day starting with hair-makeup (if their wedding package allows that much time on-site), through the final exit from the reception (again, if their wedding package allows that much time on-site). I use music that the couple picks out (lots of Royalty free music choices available! ), use cinematic fades, slow-motion cuts, dissolves and other special effects. This video is the one that you will send out, via email links that I provide, to all your family and friends. It gives them a wonderful glimpse of your day and a fun, cinematic snapshot of the Highlights.